Devil’s Stinkhorn (Phallus rubicundus) is native to the subtropical region of northern Africa, Australia, South America, northern Mexico and southern United States. It has spread throughout the eastern United States, probably in wood chip mulch imported from those regions. It is now common east of the Great Plains. It is found from spring through summer in lawns and gardens, especially where wood chip mulch is used. It grows on the ground, in wood chips or sawdust piles, singly or in groups. The fruiting body at first is whitish to pale brown and egg-shaped, and resembles a puffball partially submerged in the ground. Inside the “egg” there is a gelatinous layer, a spore mass, and all of the fully-formed parts of the mature stinkhorn. When conditions are right the “egg” ruptures and expands rapidly. In one or two days it produces a distinctly phallic structure with a stalk and thimble-like head. The rapid expansion is possible because all of the parts are fully formed and compressed inside the “egg”, and because the individual cells elongate, rather than new cells being produced. As the stinkhorn expands the gelatinous layer mixes with the spore mass producing a shiny, putrid slime that covers the cap. The foul-smelling slime is irresistible to flies, which feed on it, lay their eggs in it, and transfer spores when they fly to other stinkhorns. 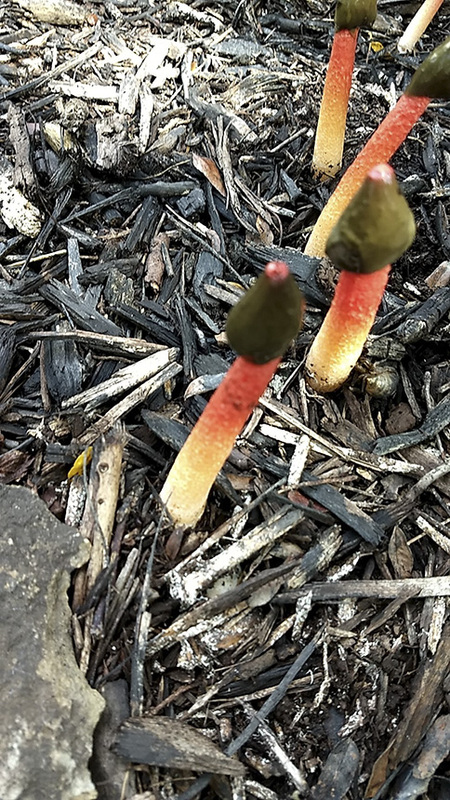 This entry was posted in Fungi and tagged Devil’s Stinkhorn, Phallus rubicundus on September 2, 2018 by John Valo.